Luxury Look-Alikes For Less: Jennifer Lopez’s Wide Leg Pants! Jennifer Lopez is not only one of the most beautiful & stylish women in the world, but she continues to set trends that are changing the face of fashion. Her latest style adventure includes wide leg pants, & she’s pulling them off like a pro, with statement tops & pops of color. While out & about promoting her new book, True Love, she’s been making headlines with her fabulous outfits as well. While appearing on the Late Show with David Letterman, Jennifer rocked a head-to-toe all-black look in a Milly crop top & wide leg trouser by Paule Ka with a cape by Noon by Noor & jewelry by Norman Silverman. In full diva fashion, Jennifer mixes up the middle look with a gold beaded Naeem Kahn top with pleated Alice + Olivia gauchos & jewelry by Melinda Maria. Lastly, she showed off her abs in a kelly green monochromatic ensemble by ICB with Christian Louboutin caged booties (shop here) & an Hermes cuff. 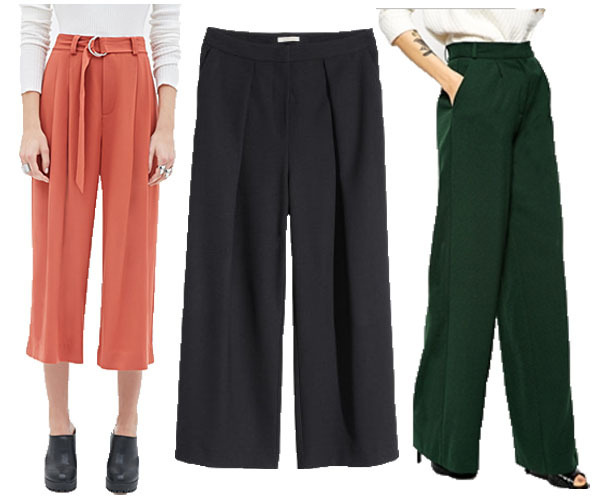 To interpret Jennifer’s wide leg pants look with your own wardrobe staples, I found the following comparable styles: Culottes in ruse @Forever 21 ($32.90), Pants in black @H&M ($59.95), & Pants in forest green @ASOS ($66.33). What do you think of this bold trend? Do you see yourself adding these to your fall look? For more stylish posts, check out must-have accessories for this holiday season & fall wardrobe inspiration from TV shows like Scandal! Happy Styling! This entry was posted in Basics for a Bargain, Luxury Look-Alikes For Less, Quickie Darling Deal & Steal, Red Carpet Review, Style Darling Daily and tagged affordable fashion, Alice + Olivia, ASOS, Basics for a Bargain, celebrity, celebrity style, Christian Louboutin, culottes, fall fashion, fashion, Forever 21, H&M, Hermes, ICB, Jennifer Lopez, Luxury Look-Alikes for Less, Melinda Maria, Milly, Naeem Kahn, Noon by Noor, Norman Silverman, Paule Ka, Red Carpet Review, style, Style Darling Daily, style for days, style icon, True Love, wide leg pants. Bookmark the permalink. ← Accessories Access: 5 Must-Haves For A Stylish Holiday Season!